A gilt bronze figure of a luohan, seated upon a rectangular throne cushion. He is depicted with his legs crossed, his upper body slightly inclined towards the left. He wears a fitted robe, which is draped down and pleated around his legs. His hands rest on his knees. He holds a ruyi sceptre in his left hand and a rosary in his right hand. The luohan’s demure face is carved in detail, showing his moustaches and wispy beard. The sides of the cushion are engraved with floral patterns resembling the texture of textiles. The bronze has several layers of gilding, with some areas showing a darker patina. 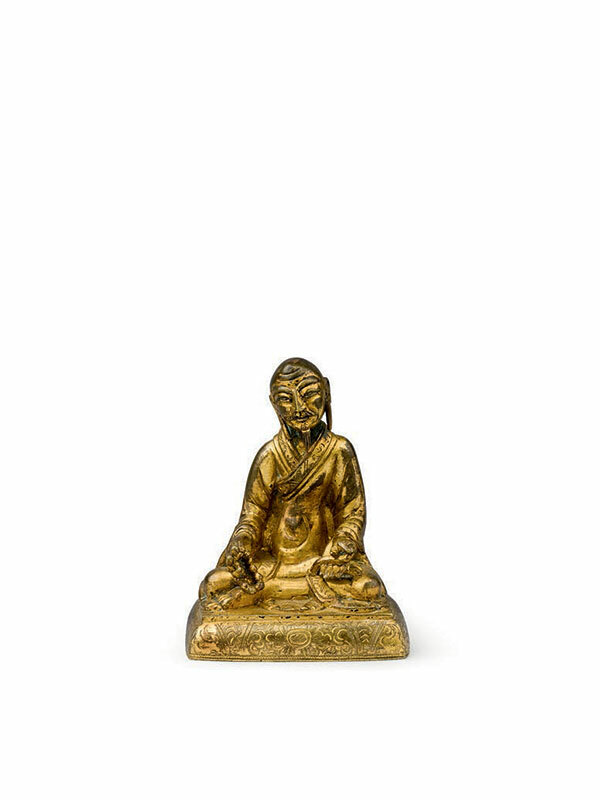 This finely cast and gilded bronze figure represents one of the Sixteen Great Luohans, also known as arhats in Sanskrit, who were considered to be the Elders of Buddhism and students of the historical Buddha Shakyamuni. Over time, the number of luohans increased from the original sixteen, as recorded in a book written approximately 800 years after the Buddha’s death by the Singhalese priest Nardimitar, to five hundred. This bronze figure likely depicts the Fifth Luohan, Nakula Arhat. Although there is no inscription to aid the identification, a rubbing of Nakula Arhat originally from Shengyin Temple has closely comparable features and also holds a rosary in his right hand. This rubbing has inscriptions written by Emperor Qianlong (1736 – 1795) and is now in the collection of the Harvard Fine Arts Library. A comparable gilt bronze figure of Guandi seated on a throne, of similar size and dated to the 18th century, is illustrated in Chinese and Japanese Bronzes, A.D. 1100 -1900.